Many Windows 10 users are getting the Windows Update Error 0x80080005 while they are trying to install update Windows 10. 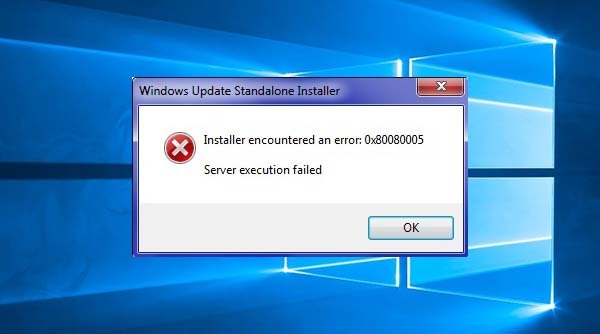 The error 0x80080005 Windows Update is common among many Windows users. It can also occur in Windows 7 and Windows 8. 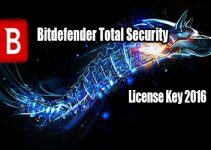 Do you have any third party security software installed on the computer? Because it comes in conflict with inbuilt and third party antivirus software. Have you recently made any recent software or hardware changes on the system? When you upgrading the system to Windows 10. Now that you know few of many reasons why the error 0x80080005 can occur on your computer, In this tutorial I will share you how to fix it. 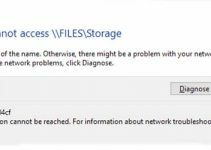 Before doing this method below, you should temporarily disable firewalls and third party security software installed on your system. Let’s try the following steps and check if it helps. Step 1. 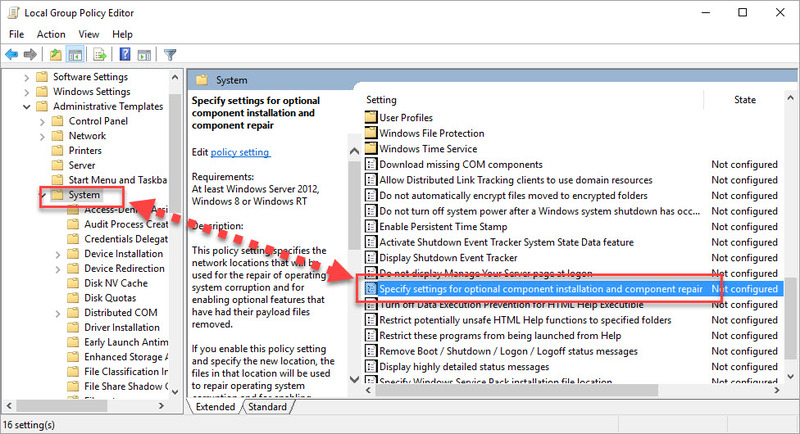 Press Windows Key+R, type gpedit.msc and click OK (tap Enter) to open Local Group Policy Editor. Step 2. In the left pane, you navigate to: Computer Configuration > Administrative Templates > System. Step 3. In corresponding right pane, you look for “Specify settings for optional component installation and component repair” setting, and double-click it. Step 4. 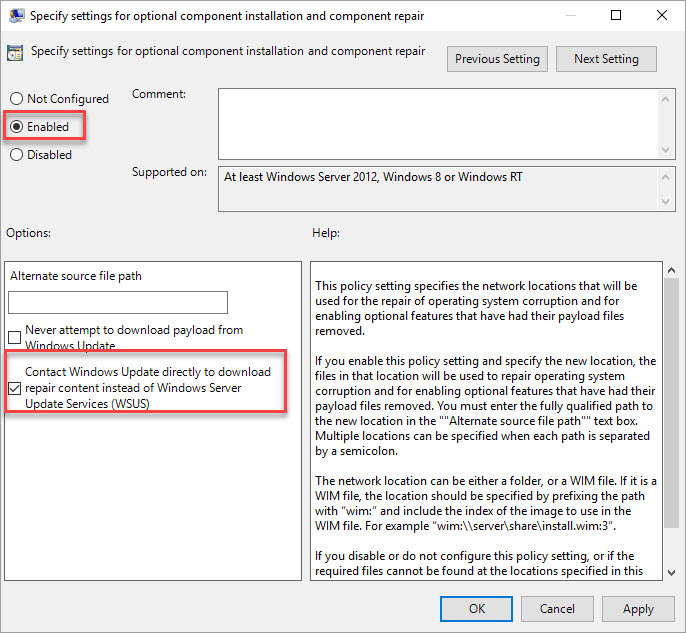 When Specify settings for optional component installation and component repair window open, you select Enabled, and click check box for “Contact Windows Update directly to download repair content instead of Windows Sever Update Services (WSUS)“. Then you click Apply and OK to save changes. Step 5. Now you open Command Prompt as Administrator. 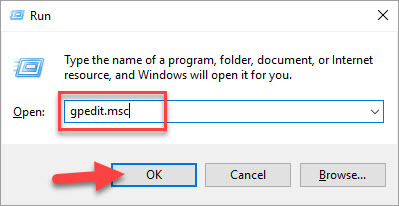 To do that by pressing Windows Key + X and select Command Prompt (Admin). Step 7. Now you need to wait until it ended. DISM normally requires 30 mins to 1 hour. Hope this tutorial helps you. If you have any other Windows and Office related issues you can check for the solution in my Windows fix section.